Reporting on the construction of one particular instrument, musician and journalist Marchese (Renovations, 2001) investigates how a box with strings attached can make such astonishingly beautiful sounds. Before the eyes of the reporter, Brooklyn-based fiddle-maker Sam Zygmuntowicz, on a commission from violinist Eugene Drucker, fabricates a musical instrument out of spruce, maple, glue and varnish. Tradition is the keynote. Zygmuntowicz works in the centuries-old mode of Cremona’s skilled luthiers, who made the finest stringed instruments of all time. Master Stradivari, it is generally agreed, made the best of them, though to this day, no one seems to know exactly how. His ghost inhabits the workshops of the world’s luthiers. Craftsman Sam competes with old masters in his creation of a violin for Drucker. The author follows him on an edifying adventure from hewn log to work of art. Though Sam adds just a bit of innovation, the construction of the classic sound box, with its bass-bar and bridge, f-holes, fingerboard, scroll, ribs and, of course, its purfling of three layers of wood, has survived industrial revolution essentially unchanged. From start to final coat of varnish, there is no assembly line for the artisans whose professional lives are bounded by legend, myth and politics as much as by acoustic science. 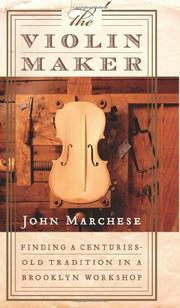 Marchese illustrates them all as Master Zygmuntowicz makes Drucker’s violin. Readers will be as eager as the author and the luthier to know if it satisfied the violinist. On-pitch reporting documents an inspiring craft.